In several cases are archival materials from the 54-year history of the Maid of Cotton beauty pageant, including photographs of contestants, publicity campaigns, advertisements, and part of an entrant’s application. Contestants depicted include the first Maid of Cotton Alice Hall (1939) and Maid Alice Corr, who appeared on the cover of Farm and Ranch in 1953. 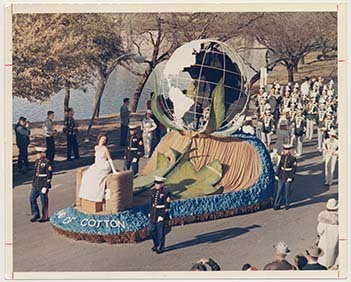 Each winner of the Maid of Cotton pageant served as the American cotton industry’s goodwill ambassador and often took part in fashion shows and photo shoots around the world. To illustrate the contestants' travels, the display also includes a copy of the 1985 Japanese edition of Cotton Promotion, which features a Maid of Cotton winner on the cover and many photos of Maids posing by such landmarks as the Eiffel Tower and the Taj Mahal.